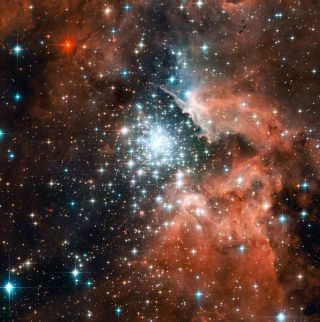 The star-forming region NGC 3603 - seen here in the latest Hubble Space Telescope image - contains one of the most impressive massive young star clusters in the Milky Way. Full story. The tiny motions of hundreds of young stars packed tightlyinside a star cluster have been revealed for the first time by images from theHubble Space Telescope taken a decade apart. The stars did not settle down as astronomers expected, butcontinued to roam about restlessly for about1 million years after the starcluster's formation, according to the new photos, which were releasedWednesday. "This is the first time we have been able to measureprecise stellar motions in such a compact young star cluster," saidWolfgang Brandner, an astronomer at the Max-Planck Institute for Astronomy in Germany. The precisely-measured motions of more than 700 clusterstars in the nebula NGC 3603 showed that the star velocities remainedindependent of their mass, which reflects conditions from the time of thecluster's initial formation. The young starcluster packs a mass of more than 10,000 times that of our sun within a regionjust three light-years wide. It sits about 20,000 light-years from Earth. Onelight-year is the distance that light travels in one year, about 6 trillionmiles, or 9 trillion kilometers. Such great distances make measurements of star motionschallenging. But astronomers knew that they could use Hubble's sharpimages of the NGC 3603 cluster taken back in July 1997, and followed up with moreobservations in September 2007. They then spent two more years extractingreliable motion estimates for the stars in the images. The iconic Hubble Space Telescope launched in 1990 andcelebrated its 20th anniversary in orbit in April. The surprisefinding about the restless star motion may lead to some rethinking abouthow quickly star clusters evolve. Such clusters usually emerge from thecollapse of huge clouds of gas and dust. They can eventually evolve into ballsof stars known as globular clusters and remain bound together by mutual gravityfor billions of years. "This is key information for astronomers trying tounderstand how such clusters are formed, and howthey evolve," said Andrea Stolte, an astronomer from the University ofCologne in Germany.